UN PNG Resident Coordinator, David Mclachlan-Karr, addresses the 68 women candidates who participated in the first ever PNG Practice Parliament for Women. 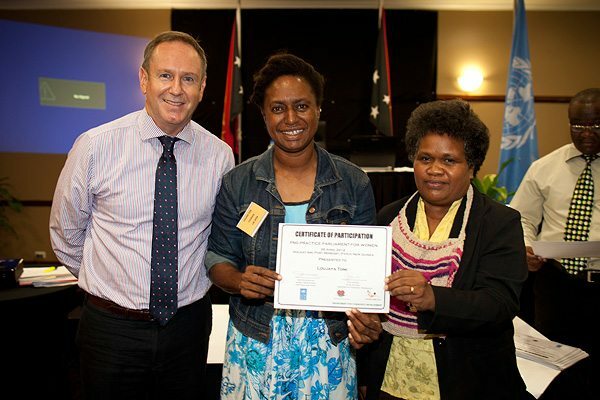 The UN is delighted to see that two women have been elected to the PNG Parliament. While a number of seats are still to be decided, the preliminary result is one important step in the right direction to ensuring more equitable gender representation in the national legislature. 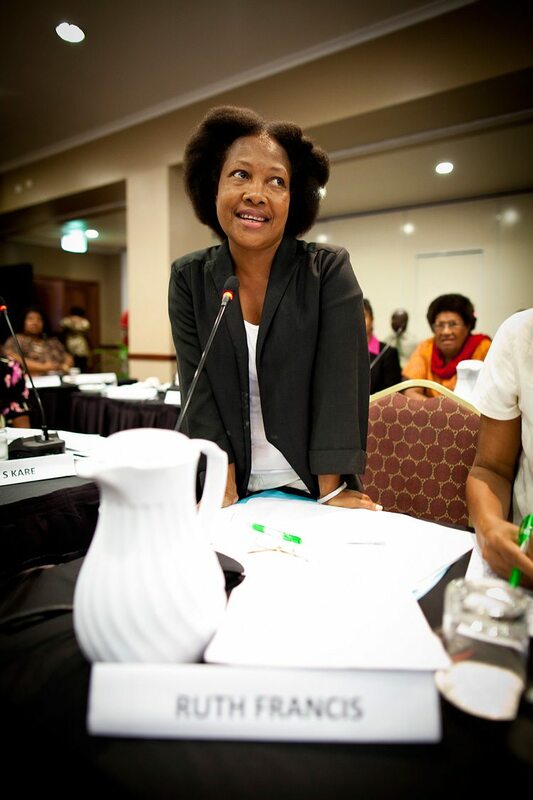 Hopeful female candidate Ruth Francis speaks up during the PNG Practice Parliament for Women. Around the globe, it has been proven time and time again, that genuine social progress and sustainable development is impossible unless the 50% of the population who are female are given the opportunity to participate in national decision-making processes. 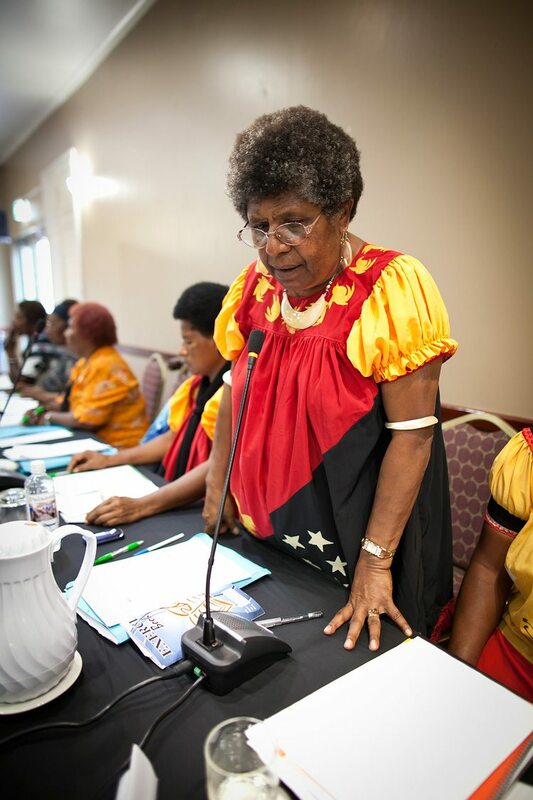 Since independence in 1975, women have been woefully under-represented in PNG political life at every level – and far too many women and girls continue to face discrimination at home and in the work force and suffer violence at the hands of their men-folk. The Pacific Region is slowly catching-up to the rest of the world in electing more women to public office, although the region still has the lowest percentage of women MPs anywhere. As part of the global trend towards recognition of the invaluable role women play in promoting equitable development and opportunity for all, a growing number of countries are now taking active steps to ensure that reserved seats are made available to give women a voice in their national legislatures, including in such diverse countries as India, Rwanda, Egypt, and in our own region, in Samoa and the Autonomous Region of Bougainville. Loujaya Toni, MP for Lae Open, who participated in PNG’s first ever Practice Parliament for Women before the elections, receives her certificate of participation from UN Resident Coordinator, David Mclachlan-Karr. The United Nations is proud to be associated with the global movement to promote gender equality and to support women to become leaders and to assume influential roles in the public life of their own countries. In PNG, the UN has actively supported national legislation to create reserved seats in parliament for women and salutes the resolve of successive governments to pass the enabling legislation – unfinished business that should be swiftly dealt with by the new parliament. 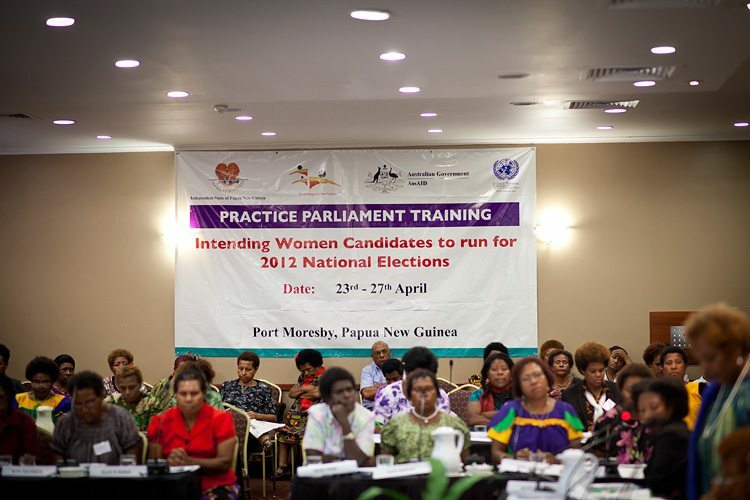 In tandem, UNDP in PNG has also promoted a ‘Practice Parliament for Women’ training module which offers aspiring female candidates an opportunity to hone their skills at parliamentary debate and procedure and in key policy areas such as gender-sensitive budgeting. UNDP and Un Women have also sponsored media awareness training for women candidates and a platform whereby women are given an opportunity to air their opinions on issues of critical national importance; including through radio broadcasts of the Practice Parliament sessions. PNG is the largest and most influential country of the Pacific Region. By giving women here more opportunities, PNG is not only setting the stage for a more equitable and inclusive development model, but will also inspire women and girls from around the region to smash through the glass ceiling to achieving high public office. When women feel empowered, and men feel confident to vote for women based on their merit as leaders, we will achieve a more equitable and representative society. The UN will continue to work with the Government of PNG on its gender journey and will be running more training programmes for intending candidates in the 2013 LLG elections. By tackling the gender divide at the grass roots level, we will eventually develop a cadre of experienced female leaders who will move up the ladder to assume even more seats in future national parliaments. To watch the Practice Parliament see all videos here: http://j.mp/RnYtSR.